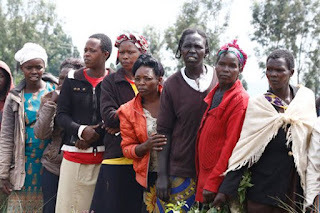 A woman in Rongai Nakuru has left the residents in shock after she poisoned her four children, then committed suicide following a domestic dispute with her husband. The woman who comes from Sumek Village in Visoi Ward is said to have poisoned the kids in order to kill all of them, but luckily three of them survived. She reportedly attempted to hack the four after they took time to succumb. She fled from her home when they screamed for help. According to neighbors they heard screams from the home on Wednesday night and when they rushed to establish what was happening they found her missing. The children were lying on the floor writhing in pain. Reporting on the incindent, Rongai Officer Commanding Police Division (OCPD) Japheth Kioko said the youngest child died due to poisoning. “Three of the children survived after they were saved by neighbors but one died. The husband was at home during the time of the incident and so we have launched investigations to establish what transpired prior,” Mr Kioko said. The week before the incident, an elders meeting had been setup to resolve the matters of infidelity but it didn't end up well.